When I was in 11th grade I was diagnosed with Seborrheic Dermatitis (SD). This is a skin condition where the skin produces excessive amounts of oils. The overproduction leads to skin flaking/scaling, irritation, itchiness, soreness (due to scratching the area), and peeling. Visually, it is like having dandruff on both your scalp and your face. Scratching the skin worsens the condition leading to larger areas of the skin being affected and increased itching/irritation. I have SD on my scalp (looks like dandruff), in my eyebrows, near my nose, and in my mustache. SD is not curable but it can be treated. My journey to treat this condition began with prescription medications for my face and scalp. I had to apply the prescription ointment 2-3 times per day; the prescription shampoo required that I allow the shampoo to sit on my scalp for 10-15 minutes before washing my hair. If I missed an application, the condition worsened! Initially, the spreading scared me into using more of the prescriptions, but I soon realized the connection between the spreading condition and the prescriptions. At one point the SD reached the middle of each cheek and the spots on my scalp increased in size. I decided to stop using the prescriptions. Soon after stopping, the spreading reduced back to the original size. Because prescriptions were too strong, I began trying antifungal creams, medicated shampoos, medicated creams and lotions, and high-end skin creams over the next several years of my life. The antifungal creams worked for 2-3 hours, then had to be reapplied. After a few days it had the same effect as the prescriptions—the condition began spreading, though at a slower rate than the prescriptions caused. The medicated shampoos only helped for an hour or two after showering. The lotions and creams wore off after 2 hours. I tried remedies like applying extra petroleum jelly or baby oil to my face and scalp, cleaning my trouble spots with rubbing alcohol, and shaving my hair off. Nothing worked! It seemed like everything available to me either made the SD worse or did nothing at all. Today, I am free of all the symptoms associated with SD! My skin is clear of flaking/scaling, scars from peeling, excessive oiliness, irritation, and itching. My scalp is no longer filled with dandruff—I can finally brush my hair without flakes falling everywhere. I do not use special soaps or shampoos. I do not eat a specialized or strict diet. Yet, my skin is healthy and getting better every day. Every morning after washing my face I apply a fingertip worth of Elsen Oils Coconut & Avocado Oil to my face. Elsen Oils Coconut & Avocado Oil softens my skin on contact and protects my skin throughout the day, as long as I do not wash my face after application. For my scalp, I apply one fingertip worth of Elsen Oils Hair Cream. This soothes and moisturizes my scalp immediately. You can read about the ingredients and the benefits in the “Our Ingredients” section. I picked up my evening regimen from my wife. In the evenings, 2-3 nights per week, I apply 2-3 fingertips of Elsen Oils Coconut & Avocado Oil to my face and allow the oil to soak into my face. I do this at least 30 minutes to 1 hour prior to going to bed. By the morning the oil is fully absorbed. Finally, once per month I apply Elsen Oils Cooling Patchouli Mud to my hair and face. Made from Dead Sea Mud, this mud is loaded with minerals that benefit hair, face, and body! I allow the mud to remain on my face for 10-13 minutes; then I wash the mud off. The mud mask detoxifies, softens and smoothes my skin and scalp but it also leaves both dry. I apply Elsen Oils Coconut & Avocado Oil to my face (one fingertip) and Elsen Oils Hair Cream to my scalp (one fingertip) to moisturize my skin and scalp. You can see the videos of how to apply the mud at the bottom of this page and in our “Videos” section. Initially, I used the mud mask once per week. As my skin became healthier I was able to reduce the masks to two times per month, then to once per month. Depending on the severity of the SD, you may have to use the mud up to 3 times per week. Allow your skin time to heal, leave at least one day between applications and do not apply the mud more than 3 times in a week. Set a goal of reducing the mud application to once or twice per month. My evening regimen used to be nightly as well. As my skin became more resilient against the SD, I was able to cut back on this process as well. I hope to be able to make this a weekly process soon. My hair is short, you may have to apply a little more of the Hair Cream to your hair and scalp if you have long hair (start with a fingertip worth, then add a little gradually—with Elsen Oils products a little goes a long way). Eczema sufferers can substitute Elsen Oils Golden Avocado Hair Butter (GAHB) for the Hair Cream. The vitamins and minerals in the GAHB help the body counteract eczema. All Elsen Oils hair care products are safe for body, we recommend Elsen Oils Coconut & Avocado Oil for face, hair, & body. My wife has used this regimen longer than I have and her skin is flawless! Elsen Oils products are designed to nourish hair, face, and body with naturally occurring vitamins, minerals, and essential fatty acids found in oils, butters and other natural ingredients. I want to share my skin and scalp regimen with all who are suffering with SD. Please send this story out to as many of your friends and family as possible, somewhere in your circle someone may be suffering from SD. 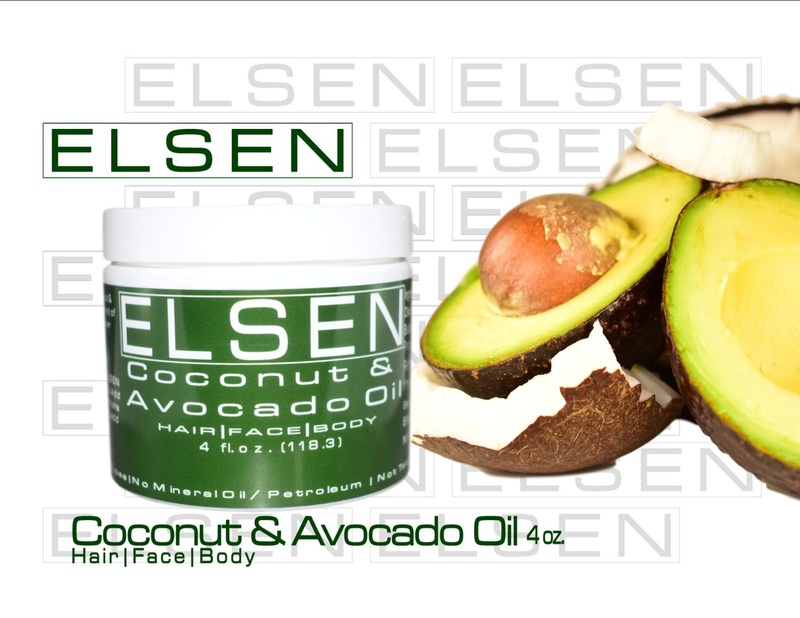 Elsen Oils Coconut & Avocado Oil 4oz. Our lightest oil blend! Elsen Oils Coconut & Avocado Oil is perfect for daily moisturizing of hair, face, and body. 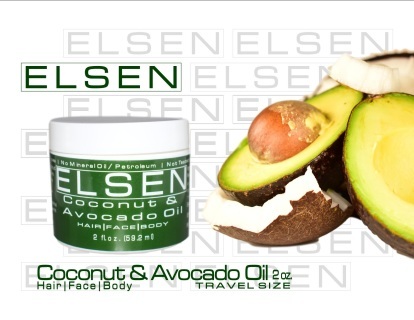 Elsen Oils Coconut & Avocado Oil Travel Size 2oz. 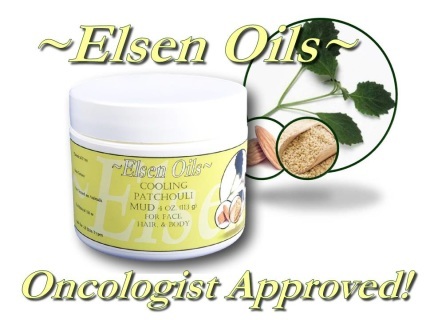 Elsen Oils Cooling Patchouli Mud 4oz. Relax the night away with our Cooling Patchouli Mud Mask. Perfect for dry/eczema prone skin and dry, flaky hair & scalp. 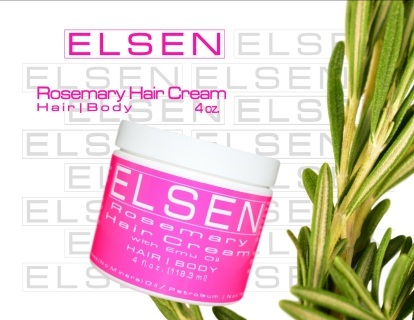 Elsen Oils Rosemary Hair Cream with Emu Oil 4oz. Exceptionally light, but strong enough to be used as a leave-in conditioner; protects hair against environmental changes and heat processing; use daily as a moisturizer, weekly as a hot oil treatment or scalp conditioner. 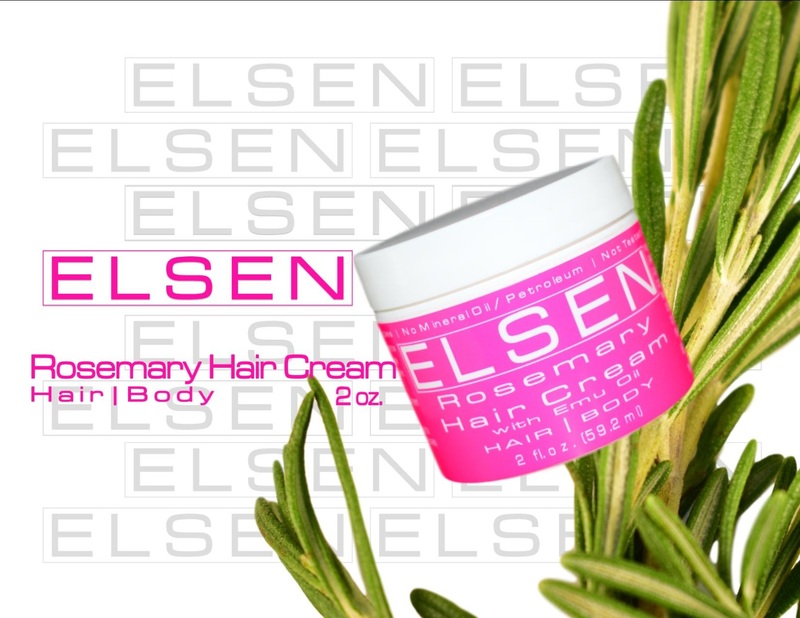 Elsen Oils Rosemary Hair Cream with Emu Oil Travel Size 2oz.